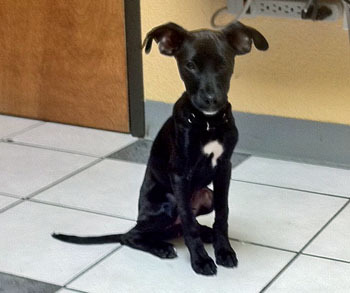 Zane is an untattooed, male puppy believed to be about 5 months old. Zane is black with a white toe on both back feet, a white blaze on his chest, and a touch of white on his chin. He came to GALT as a stray from the Amarillo Animal Shelter. 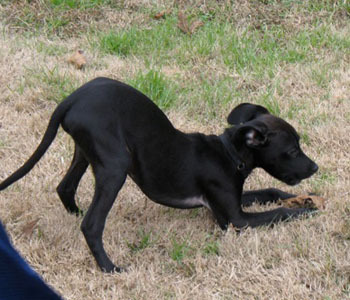 Zane was successfully treated for a cough, and is now ready to wiggle his way into your heart! Zane is cat tolerant and gets along with other dogs of all sizes. Zane's growth pattern is not matching the usual measures for a greyhound puppy, so it's likely that he's a mix and will be quite a small boy. A DNA test has been submitted, and as soon as results are received, they will be published. The results are in, and Zane is quite the "honorary" greyhound! 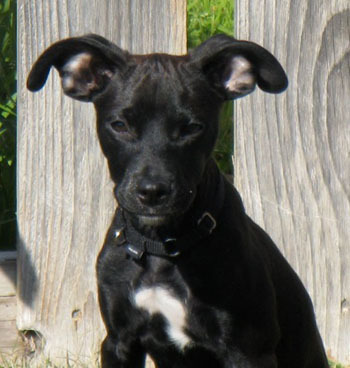 This little guy is going to have to be a mascot for the hounds, as he is mainly a Rat Terrier and American Staffordshire Terrier mix, with a few "other" breeds mixed in there somewhere. As an adult, Zane will probably weigh in somewhere around 20 or 30 pounds. 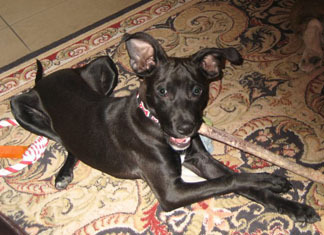 This little cutie is still having fun hanging with the big dogs, and will make someone a loving, happy pet.